Chelsea have completed the signing of centre-half Gary Cahill from Bolton Wanderers for a fee of around £7m. Cahill, 26, passed a medical on Saturday, before attending Chelsea's 1-0 Premier League win over Sunderland at Stamford Bridge. "Chelsea is a massive club that looks to win trophies season in, season out," said the England defender. "It is a big opportunity for me to be a part of that. Opportunities like this you can't turn down," he added. "This is the right move for me at the right time. "I would like to thank everybody at Bolton because I have had a great four years at the football club. "My spell with Wanderers has enabled me to break into the England squad. "I would particularly like to thank the fans for their support along the way." Chelsea and Bolton agreed the fee at the end of last month, but Blues boss Andre Villas-Boas revealed that club and player were "miles apart" over personal terms. Reports had suggested Manchester United were also interested in signing Cahill, who would have been out of contract at the Reebok in the summer. But Villas-Boas has finalised the deal to strengthen his defensive options ahead of the Blues' triple assault on the Premier League, Champions League and FA Cup. Centre-back Alex is set to leave Stamford Bridge, the Blues having discussed a fee for the Brazilian with west London neighbours QPR. 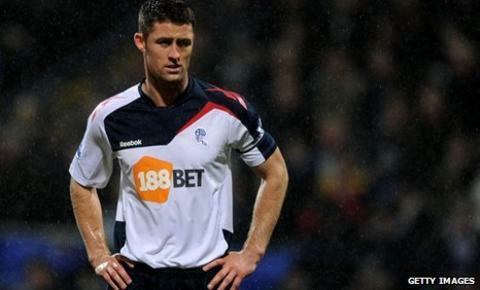 BBC Sport understands that second-bottom Bolton will reinvest all of Cahill's fee into new players as they look to stave off relegation. Bolton boss Owen Coyle has been linked with signing 24-year-old USA international defender Tim Ream, who recently trained with the club, as Cahill's replacement. Cahill signed off his Wanderers career on 5 January by scoring the winning goal as he captained the side to a 2-1 victory at Everton. The Sheffield-born player, who joined Bolton in a £5m move from Aston Villa in January 2008, made 147 appearances for the Trotters, scoring 15 goals. He made his first England start against Ghana in March 2011, scoring his first international goal in the 3-0 victory over Bulgaria in September.